“Creps?” I put down my beer and stared at her. “Creps? Do you mean Crepes?” Crapes. Now she was sounding normal, like my side of the family. Those pancake thingies. Why not, I said. With no other dinner plans in mind, it was looking like breakfast cereal or canned soup anyway. Why not crepes? As it happened, I had a recipe for them sitting in the yellowing pile of newspaper recipe clippings I keep on a serving plate in my cookbook shelf. I’d always intended to study it and try my hand, and as always I’d never get around to it unless I got a little nudge. Crepes and me go way back. Back to my first days in San Francisco, anyway, when the dot.com boom was kicking into overdrive, the rents were high and the apartments scarce. We stumbled onto a little creperie in sunny Parnassus Heights that sustained us for several weeks as we got settled. Growing up as I had, on TV dinners and frozen Eggo waffles, my first roasted red pepper and feta crepe was a revelation. And that was before I had the Nutella crepe. At the time, a restaurant called Ti-Couz did bang-up business serving rude buckwheat crepes to an adoring Mission-district crowd. More worldly friends shrugged. Crepes are sold out of street carts in France and elsewhere. But to a naif from the backwoods of suburban Los Angeles, discovering crepes felt much like discovering the wheel. Since then I’ve associated crepes with a European sophistication that I can never approach, only worship from afar. 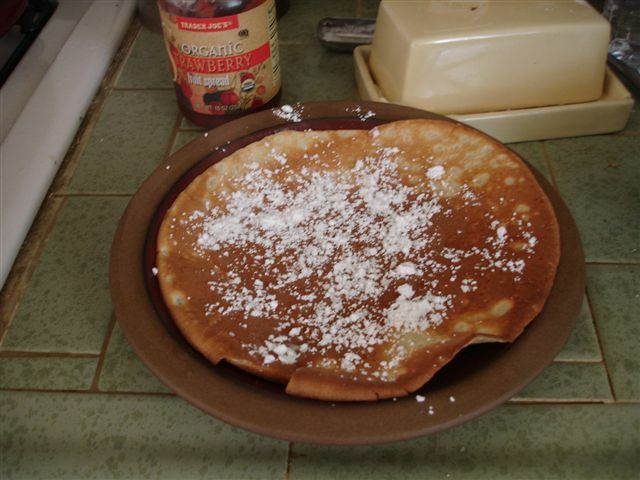 But this recipe, and an entire page of exegesis, from the L.A. Times, promised otherwise: Making delicious, delicate crepes: It’s easier than you think. That’s probably why I cut it out a year ago. It sounded easy enough. Flour, eggs, milk, sugar and butter. Chilled for an hour, then spread thinly into a hot crepe pan. I could even make the buckwheat galettes like they served at Ti-Couz. So I used up the last of my eggs, wondering only in passing about what it would do to my cholesterol level. I whipped the whole thing up by hand because my blender no longer works properly and I still haven’t worked up the gumption to buy myself a food processor. I chilled the blend for one hour per the instructions. I do not have a crepe pan, but why do I need that fancy hi-falutin’ crap? My Target-bought non-stick pan, the one that lovingly bears my tortillas, would do just fine. And it did. How wrong can you go with eggs and flour and sugar? I mean if kids are going to eat it? I made, er, pancake-like crepes, and covered them with sugar and lemon juice (and several with only Nutella), and the kids were delirious with pleasure. But I can see it’s an art that needs a lot of fine tuning on my part. I need to practice the details so my crepes will be the sort of paper-thin wrappers I can then stuff with all manner of savory or sweet delights. (I’ll worry about how exactly I plan on making those later). And one day, when I’m a competent home cook, I’ll be able to whip up a mess ‘o crepes any old time I feel like it. And oh, how cool would it be if I could make crepes? My daughter would never go abroad and act the unsophisticated rube I did. At least she’s already got the poncy pronunciation down. But if she calls them those pancake thingies again I’ll have to take away her Nutella. So proud of Annie for (a) using the correct pronounciation, and (b) calling them “pancakes,” which is what they are in England, to distinguish them from the stodgier US-version. I used to make the kids crepes almost every Sunday morning – that’s an institution that needs restoring. I can’t help it. The word “Crapes” sounds bourgeoisie and pretentious, so I call mine “Creeps” and people look at me strangely for being pretentiously weird. I serve them stacked with the thinnest coating of syrup I can spread over the top, with fresh fruit and coffee. Simple. It’s not a crepe- can you even call it a crepe, if it isn’t rolled? A “pancake thingie” describes it closely enough, but really, it’s a Creep. i’m hungry, pass the Nutella. My family doesn’t even really know what pancakes are..it’s creps all the way for us. My husband is the master at making them and does so nearly every weekend. They seem to work better if you let the batter sit over night. My french friend substitutes champagne for some of the liquid. I love butter, sugar, and lemon juice on mine…une crepe au citron. I’m from the UK orignally and it was always crepes for us too, except we called them pancakes. Always with lemon juice and sugar or golden syrup.